My favourite exhibit in the Shanghai Museum has always been the one on the top floor, of the Chinese Minorities. 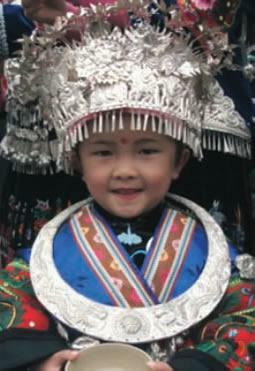 Officially fifty-six distinct ethnic groups live in China – from well-known groups such as the Tibetans, Mongols, and the Han (the dominant ethnic group) to relatively unknown ones like the Miao (Hmong in South-East Asia) with their exquisite silver jewellery. The Shanghai Museum is (rightly) well-regarded, but of all the permanent exhibits it is the Minorities which is the most colourful, the most intriguing, the least expected as it is the least ’Chinese’. 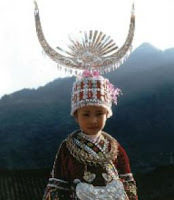 I was looking at a display of Miao silver jewellery and noticed that all the pieces came from Guizhou province– in particular the region surrounding Kaili. The necklaces, earrings and hair ornaments were made of the lightest, finest silver I’d ever seen. So for my next trip I decided to visit Guizhou – out of curiosity, and to see if I could buy any jewellery for myself. 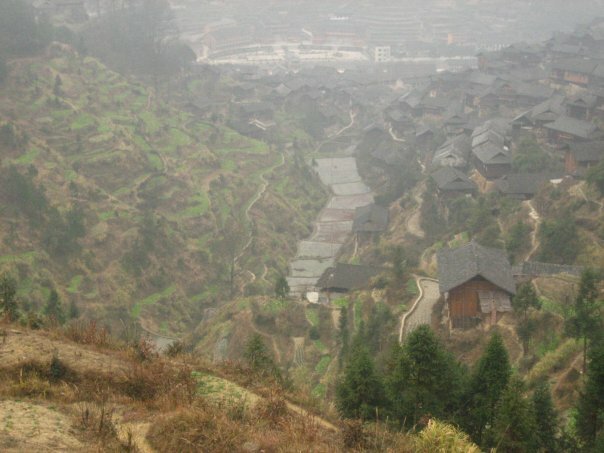 My plan was to get out into the Miao villages as quickly as possible, using the town of Kaili as a base. 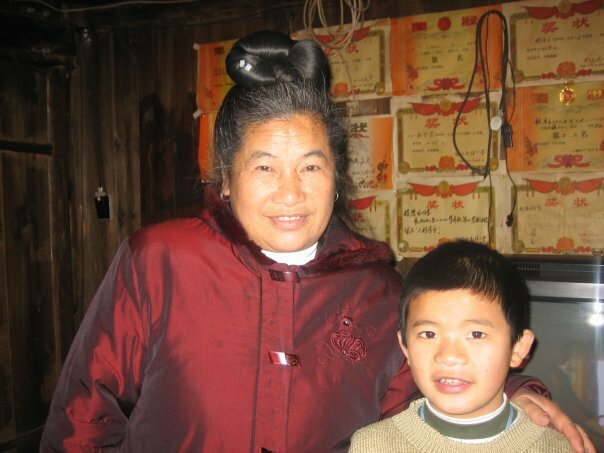 Kaili is a down-to-earth, slightly rough around the edges sort of place, and the people are extremely friendly! It’s definitely not weary of tourists, and has an authenticity lacking in more visited parts of China. (all remaining photos by Elizabeth Watson) Above left, Kaili street scene. 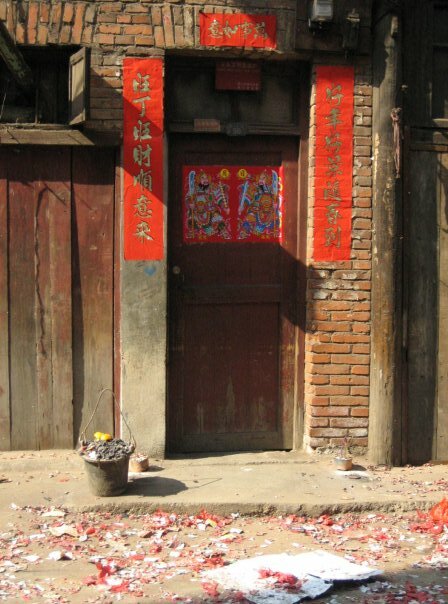 Above right, Chinese New Year banners pasted on a doorway for luck. 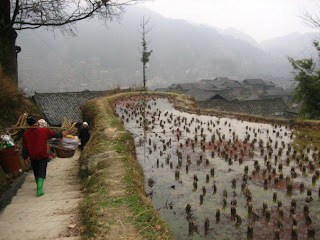 I travelled by bus to Xijiang, the largest Miao village of the region, where over a thousand wooden houses on stilts lie nestled in between endless rice terraces. 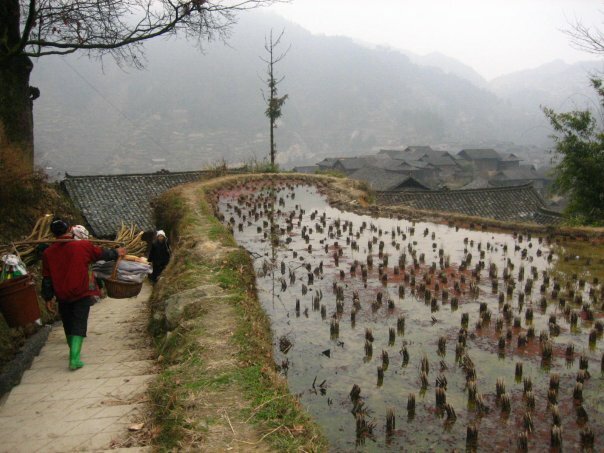 Very picturesque, Xijiang has in recent years experienced a flux of tourists, and aspects of it are becoming commercial, for example charging an entrance fee and building a new town square large enough to give performances of traditional dance. 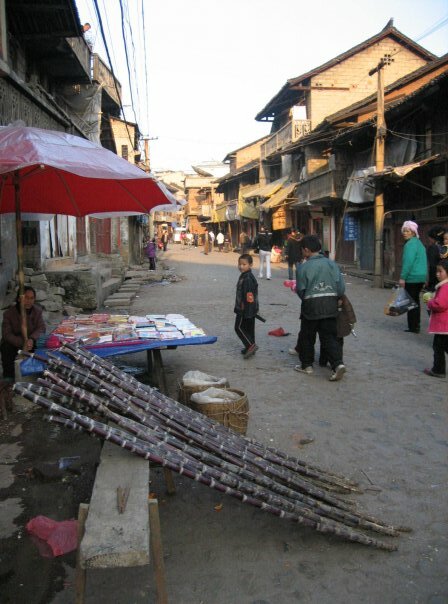 When I went in 2006, only the old town square existed, with a Miao ‘spirit pole’ in the middle. 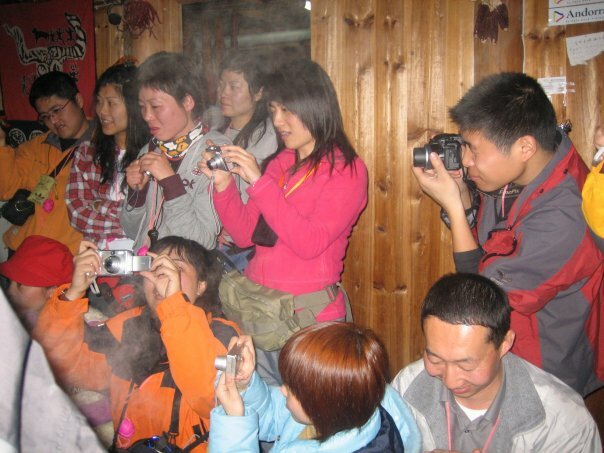 However recent changes, at least compared to other Chinese tourist sites which have been changed beyond recognition, have been kept to a minimum, for example still using wood to build new hotels and bridges in the traditional manner. 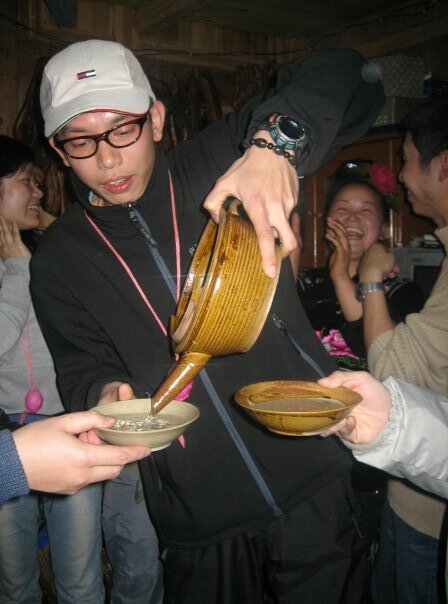 My guesthouse invited me to a welcome party, Miao-style, where travellers were given copious amounts of rice wine and traditional food. With a surprisingly clear head, I spent the next few days exploring the paths traversing the hilly terraces above (the foothills of Leigong Mountain). The air feels very fresh, especially if you’ve just arrived from one of China’s many smog-ridden cities, and the views down into the valleys spectacular, even through the mist. It’s peaceful and quiet, and the only people you’re likely to meet are farmers and their buffaloes. I spent some quieter evenings with the host family I was staying with, and they showed me some of their traditional instruments and chatted about their local history. 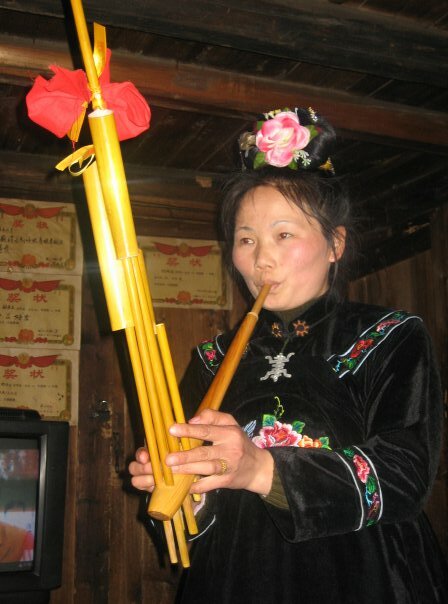 Above left – a Miao lady plays the shusheng – a traditional folk instrument. Above right – a Miao grandmother and grandson at home. And I finally managed to buy some jewellery – two pairs of earrings and a ring, all made of delicate white silver.